Phenomenal Literature welcomes unsolicited submissions of novels, poetry, short stories, drama, plays, Critical/Research/Academic Articles, translations, book reviews, interviews, biographies, autobiographies, memoirs, essays, travelogues and creative writing. We consider unpublished work(s) only. We read submissions round the year. Reviewed and accepted manuscripts are published in the latest issue of the journal. Therefore, you are requested to wait until you receive our decision on the status of your previous submission. The response time can vary according to the number of submissions we receive. Remember, poems submitted for the journal, VerbalArt can also be considered for its sister journal, VerbalArt: A Journal Devoted to Poets & Poetry. Novel: Submit a chapter from book length manuscripts of your novel. It should be a maximum of 3,000 words. Short Story: Submit only one short story of maximum 3,000 words. Play/Drama: Submit a scene or part of a play/drama which may fall in the word limit of 2,500 words. Biography/Autobiography/Memoir/Travelogue: Submit a piece of biography/ autobiography/memoir/travelogue of not more than 3,000 words. Interviews: You can send your interview with a celebrated author and should be of not more than 3000 words. The interview should be informative and inspiring. Please note, we can’t guarantee that all books sent to us will be reviewed and all reviews submitted will be published. The quality will be given preference. 1. Article should be a maximum of maximum 3000 words. Translations: You can submit English translations of fiction and non-fiction too. The word limit of submissions will remain the same as in the cases of original categories. If you are submitting a work of translation, please indicate whether you are in the possession of translation rights from its original author. All submissions are to be sent as an MS Word attachment at the email id: editor@phenomenalliterature.com (except book review). Don’t forget to give your brief bio, email id, postal address and contact number (optional) at the top page of the attached document. You will receive an Auto Response. 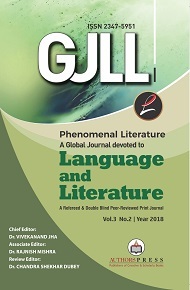 Every Indian contributor will get a free print copy and foreign contributor will get a free ecopy of the journal in which issue his submitted piece is published. ​Even foreign contributor can get a free print copy of the journal if he/she bears the shipping charge. This is indispensably required as we don’t want to take a risk of another literary journal getting ceased its publication after few issues because the cost of shipping the journal to overseas is more than its printing price.